The eight trigrams may correspond to sephiroth 2-8 of the tree of life. Note for example that the Sun Sephiroth fits well with the trigram composed of 3 yang lines whilst the Moon Sephiroth corresponds with the trigram composed of three yin lines. The central/neutral Tao may correspond with sephiroth 1: Kether and sephiroph 10: Malkuth. Both are on the central neutral column and both correspond numerically with number 1(ie 10=1+0=1). The trigrams are not positioned arbitrarily: each is placed so that it opposes its opposite and thus cancels out to neutral/tao. 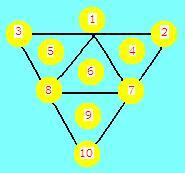 The basic geometric shape of a triangle composed of 6 smaller triangles may correspond with the (from bottom to top) "1,1,2,1,2,2,1" structure of the Tree of life.